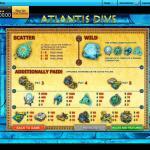 Atlantis Dive is GameOS’ take on the often-produced Atlantis theme. The mythical submerged city is back in this game, and it is has never looked more fantastical. 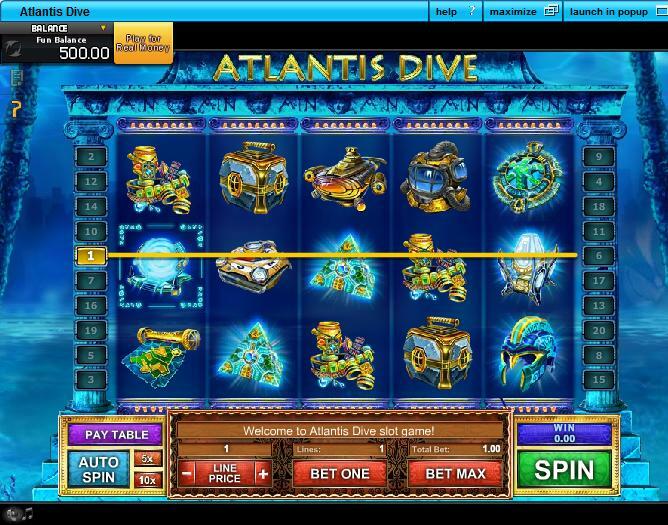 This is a slot machine game which offers a very basic format of slot gaming, all the way dishing out treasures of its own, some of which are worth up to a non-progressive 2,500 coins in all. To bring those sunken treasures to the surface, you will need to land 5 gemstone symbols on any active line. 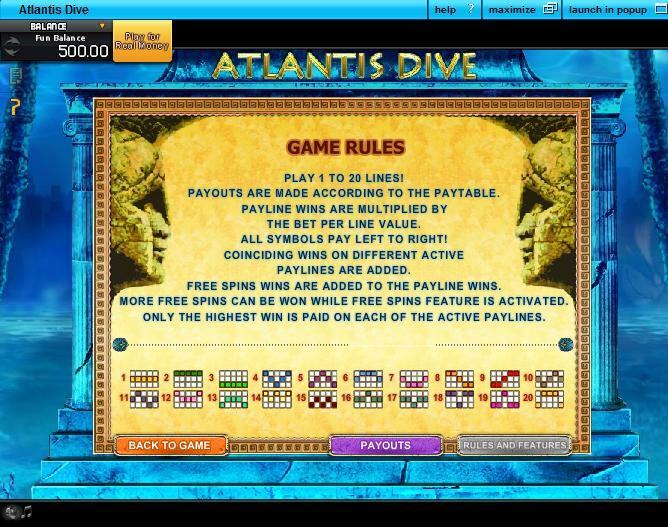 Atlantis Dive offers up a simplistic 5-reel, 20-line gaming structure, with players able to select line bets of 0.05 up to 5.00 in all. 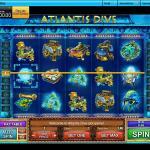 Players can expect to be able to wager anything from a rather hefty floor bet of 0.05 per line per spin, up to 100.00 per spin. This is a very basic, very predictable slot machine game, so don’t expect fireworks when you spin the reels of this slot. 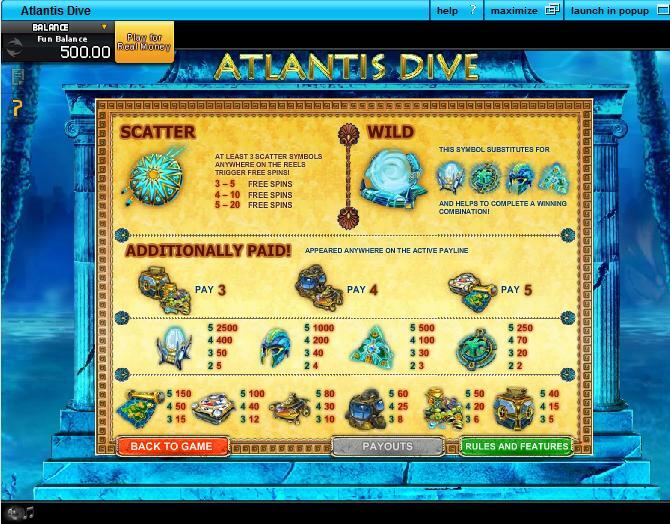 It will appear most appealing to newbies, or anybody who loves Atlantean themed slot machine games. Keep your eyes peeled for the pearly portal looking symbols – as you may have guessed, there is no good way to describe this symbol. The vague icon is actually a wild symbol, and it can substitute for all high paying symbols in the slot machine game. It does not offer cash prizes on its own, though. Scatter icons appear as pendants, and when 3 or more of these land anywhere on the reels, players will trigger a free spins bonus round. Players may also wish to keep their eyes peeled for three “Additionally Paid” symbols. These symbols can offer too boost your wins when they appear on any winning payline with other paying symbols. These symbols only seem to appear in this slot machine game, and haven’t really been found in any of the other major slot machine games that have been developed by GamesOS. Once the free spins bonus round has been triggered, players will either start the bonus with 5, 10, or 20 free spins. The number you get depends on whether you landed 3, 4 or 5 scatter symbols, respectively. Everything about the bonus feature in this slot machine is pretty basic. Don’t expect to be able to win thousands playing these features, but bagging decent wins considering your stakes is a more than reasonable feat to achieve.